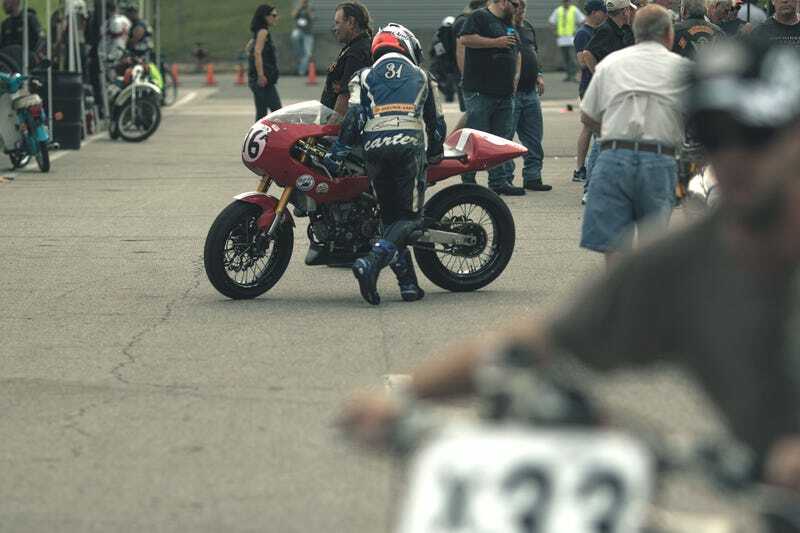 Dear hipsters, I spent the weekend watching your dads race motorcycles. And it was awesome. Every October the ones that have it all figured out head down to Alabama for a an event known as “Barber Vintage Festival,” and before you shrug it off because it has the word “vintage” in it, you really need to give it a chance. Why? Because racing, and who doesn’t love that. I left my home in the Midwest just as the weather was beginning to feel like perfect “go be anywhere else,” temps and headed down to Birmingham, Alabama with a superbike in tow, you know, because I wanted to fit in. To my surprise though, no one minded the fact that I had a modern, 150 horsepower, Rotax-powered, hell-factory and more people there loved it than normally happens on any group ride I take it to. It got me thinking, what is it with these guys that they come down here to race vintage bikes but then fall head over heels for a superbike? Then it hit me: these are the dads of hipsters, and instead of retiring into a C6 Corvette for one weekend a year at woodward dream cruise, these trackside heroes chose vintage racing as the escape from their daily grind. Why vintage? Because it’s cheap... well, cheaper than any modern superbike, anyway. A walk through the paddock here can still reveal a small fortunes and sometimes two or three generations coming together to fight for a podium spot. Really, “Vintage” doesn’t even fit the event well. Leaf through the rulebook and the restrictions seem almost impossible to meet with anything newer than 1968, but from down here you quickly realize that its more “run what ya brung as long as its not new,” thanks to every class allowing anything similar to race. So a brand new Ducati Monster can race in the battle of twins as long as it’s air-cooled. Lack of fairness aside, how can you not get on board with that? What that does for the racing is fantastic. Some classes stay competitive to the bitter end as they pit superbikes head to head, but others look and feel more like a track days at first glance. Don’t get me wrong, those guys are still fighting tooth and nail for the win, but they also know that when it comes down to an M620 against their XS650, it’s far more important to beat the other XS650 rider. It’s just part of what you live with when you race on the affordable end of motorcycles. The soundtrack down here is unlike anything you’ve ever heard at a track. Even though the classes are varied, one thing remains unchanged and that’s the desire to win. The biggest thing that separates these distinguished gentlemen from guys like Mr. Rossi though, other than being Italian, is that come Monday when they go home no one will know them from the next guy on the street. I don’t really dig sports that much, but I imagine it’s kind of like the purity people claim they find with college football over the NFL: they’re not there for the fame, they’re there because racing is worth being there... or, you know, because footballing is coolish. I know no one will argue that racing is great and all, but why Alabama? Aren’t there other places? Shouldn’t this, like everything else, happen in California? No, and to understand why you need to understand Barber motorsports park and the man who built it. George Barber. This guy was a man with a dream: to own the worlds best car collection. But, like most of us, he realized that he would need an extra zero or two on the end of his net worth and scrapped the whole idea before he decided to shame everyone else with his motorcycle collection. It’s now the biggest in the world. It’s sort like when you’re dating one supermodel and you make all the others jealous; we can all relate. That was a couple decades ago now and Barber Motor park continues to grow the worlds largest collection of motorcycles on site in its museum; by itself it would be amazing, but it also has a 16 turn 2.38 mile track on site too. The entire facility is so rad that even if you sneak off into the woods around the track you’ll still find yourself surrounded by sculptures and could possibly stumble on to a trials race. Basically George Barber is the one dad to rule them all. And, let’s be honest, if your dad knows anyone who drives a 1956 Porsche Spider on the daily, he probably shuts up and does what Saruman tells him to. It’s in the dad bylaws. If the one dad says Alabama, then all the dadlings shall flock. The event itself is big too. Like, real big. Not only does it have multiple on and off road races, parade laps, vendors, a swap meet, two killer fan zones, food trucks, and demo rides from brands like KTM and Motus, it also stopped returning Spielberg’s calls in 2006 when it was only two years old. As a way of showing the Barber Vintage Festival the respect it deserves this year, a special “family reunion” happened in the form of a small motorcycle manufacturer who rallied 90 percent of all the bikes they ever built to the races and sent most of them out onto the track. I’m talking, of course, about New Zealand-based Britten motorcycles having 9 of the 10 total produced bikes on hand for the weekend. Now, in case you’re thinking “who cares about some 10 motorcycle blah blah-” you can just jump over onto the google box and learn yourself because these bikes were years ahead of their time and completely bespoke, right down to having their engine cases cast in John Brittens bathtub. It’s basically the same process as de-tabbing a frame on that junk wagon CB550. NBD. Each bike is estimated to be valued at a cool million which only makes the fact that at least three of them were still actively raced all weekend in the open superbike class and all the rest made at least a few high speed laps every day even better. Overall, even though hipsters still showed up, it was mostly to watch their dads. Because their dads are super cool and how can you fault them for supporting a dad who doesn’t golf? If you’re missing this event because it has the word “vintage” in it you’re really letting an awesome weekend slip by and you probably shouldn’t. Sturgis can kick rocks, the Grand Prix doesn’t know how to party like this, and every other event is basically already happening in a small corner of this track on this weekends. The atmosphere is great, the racing is genuine, and the competition is just as fierce as you’d expect form any race. The difference here is the camaraderie is stronger because dads stick together. You think you’re too cool for it because vintage isn’t cool enough? I suggest you get out on the track with these guys and see the dad strength at it’s most awesome. Travis Holland is a seasoned Moto junkie who prefers living on the finer side of a hoodrat lifestyle. He prefers two wheels over four and one wheel over that. His pancakes are better than his wheelies, but we don’t recommend trying either. Following him on Instagram to keep up with his high speed antics, photographic highlights, and neophyte fabrication.